SESRIC launched the Report on the Results of the Tendency Survey on SDG Priorities of OIC Member Countries during the Seventh Session of OIC Statistical Commission (OIC-StatCom) that was held on 2-3 May 2018 in Ankara, Turkey. Submitted for the first time to 33rd Session of the COMCEC in 2017, this edition of the Report in the first half of 2018 summarizes the progress recorded at the global level concerning the work on the SDG indicator framework. 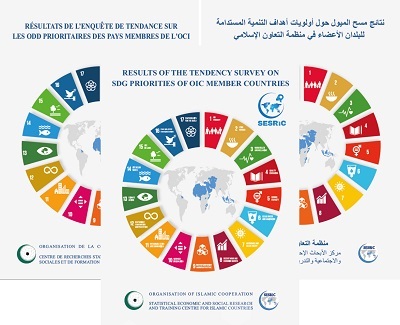 The Report furthermore informs the readers about the SDG priorities of the OIC countries as per the results of the Tendency Survey on SDG Prioritites of OIC Member Countries designed, circulated, and collected by SESRIC since 2016 and briefs the readers about the limiting factors for the achievement of SDGs, SDG coordination mechanism and SDG data availability in OIC countries. The Report shows that SDG 3 (Good Health and Well-being), SDG 2 (Zero Hunger), SDG 1 (No Poverty), SDG 4 (Quality Education), SDG 8 (Decent Work and Economic Growth), and SDG 5 (Gender Equality) are the prioritised SDGs at the OIC level as per the feedback received from respondent countries. The Report also uncovers that “Shortage of financial resources” is the most salient limiting factor and followed by “Lack of data sources to monitor and evaluate” concerning the achievement of SDGs by 2030. The Report invites the 23 OIC countries that have not responded at all to the Tendency Survey of SDG Priorities of OIC Member Countries to submit their responses on a timely basis so as to enable SESRIC to depict a more comprehensive SDG prioritisation at the OIC level. The Report has been submitted to the 34th Meeting of the Follow-up Committee of the COMCEC. To be updated in accordance with the new incoming responses from OIC countries and changes in SDG data availability status, the Report will also be submitted to the 34th Session of COMCEC planned to be held in last quarter of 2018.